Recipe by Lauren, Healthy. Delicious. 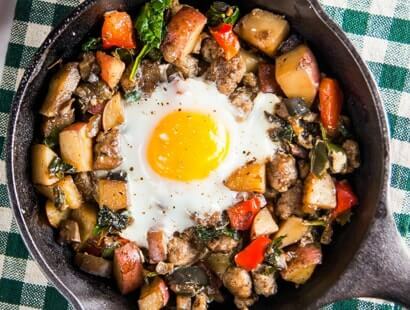 Packed with fresh vegetables, Jones sausage and a baked egg, your guests will appreciate this wholesome option on your breakfast menu. Remove sausage form casings (if raw). Crumble into large, oven-safe pan (preferably cast iron) set over medium-high heat. Cook, stirring occasionally, until sausage is golden brown and cooked through – about 8 minutes. Transfer sausage to plate. If sausage is precooked, cut into small pieces and warm in skillet until golden brown and heated through. Return pan to stove and reduce heat to medium. Add onion and garlic; cook 1-2 minutes. Add potatoes, poblano, and red pepper; cook until potatoes are browned and crispy – about 10 minutes. Stir in eggplant, mushrooms, and water. Cook for 10 minutes, or until water is evaporated and vegetables are cooked soft. Stir in kale. If desired, divide the hash between six ramekins to make individual portions. Crack eggs onto hash; one per portion. Bake 10-12 minutes, or until whites are completely set.